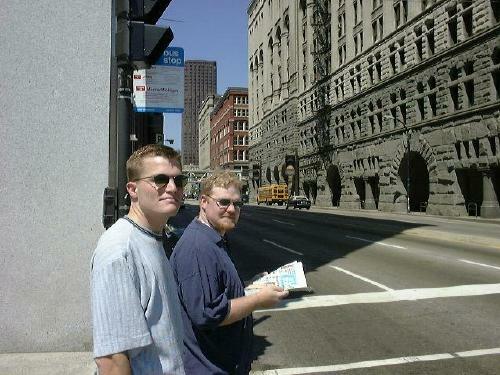 We hit the mean streets of Chicago. 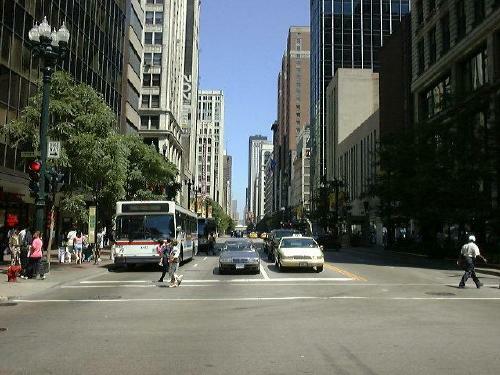 Walking along Michigan Avenue towards the center of town. Looking toward the Financial District and the southern portion of the EL. 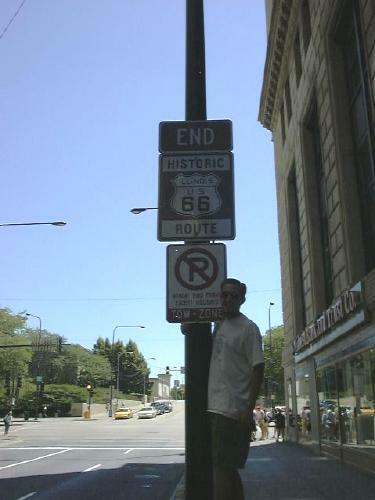 Todd at the terminus of the Mother Road, Route 66, at Michigan Avenue and Jackson Street. 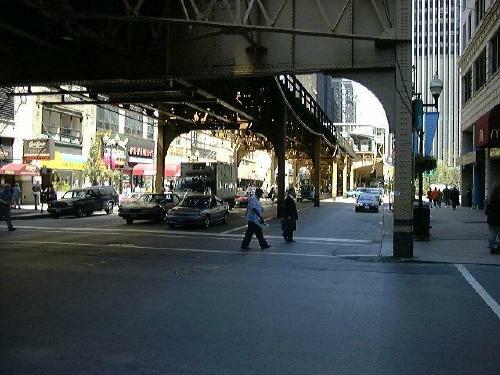 Standing underneath the Elevated, as we enter the Loop towards the Sears Tower. Sears Tower Skydeck, looking south toward the South Side. 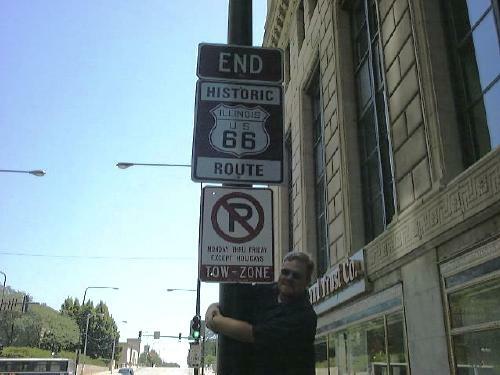 I90/I94 threads its way south. This will be the road out of town toward Cleveland and points east. Looking southeast toward the famous Meigs field of Flight Simulator fame. 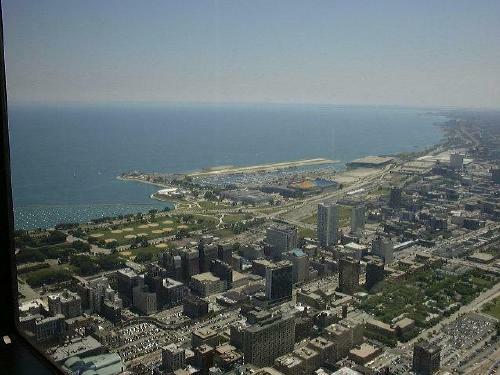 Also in view is Grant Park. 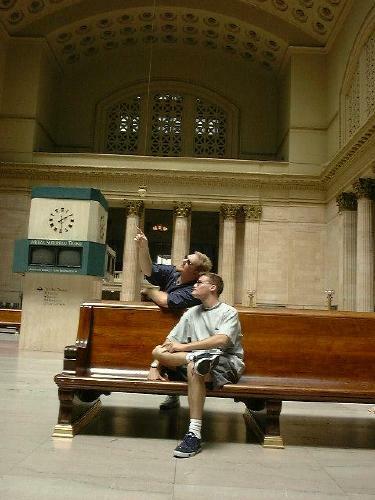 Union Station. 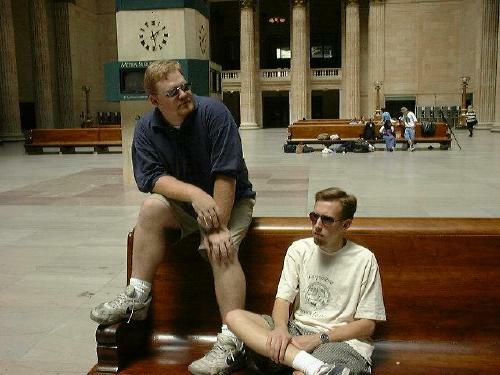 We figured that Union Station in a great railroad town such as Chicago would have been impressive. Unfortunately most of the turn of the century portion had long been torn down, but this main room was pretty cool. Here we are getting "artsy." 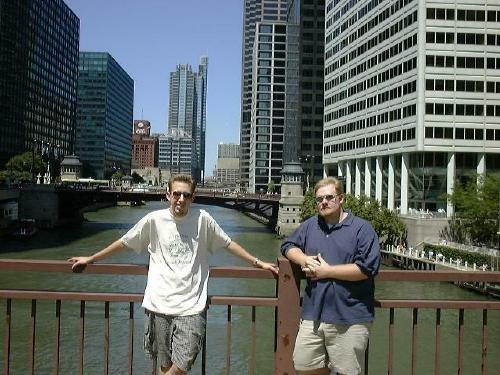 Todd and Michael contemplate the Chicago River. Water Taxi anyone?? 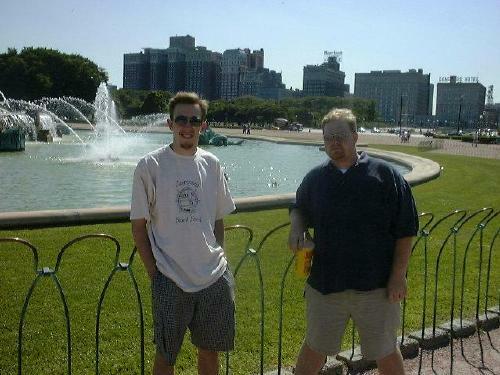 David and Todd. 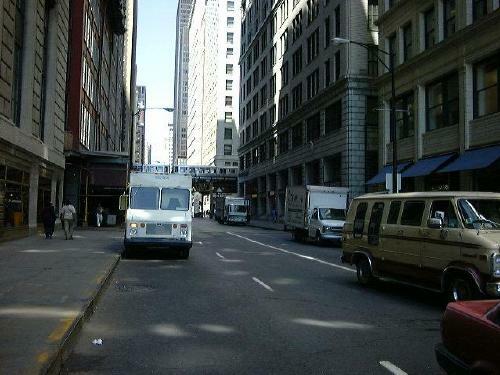 The drawbridge was shaking violently as busses and trucks passed. 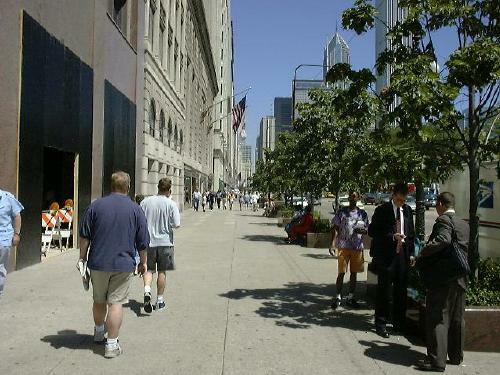 We were impressed with Chicago's abundant public space, even in the Financial District. Here we are taking a break for lunch. 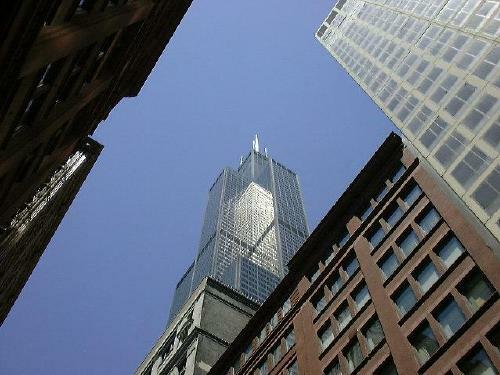 The height of the surrounding buildings is impressive. 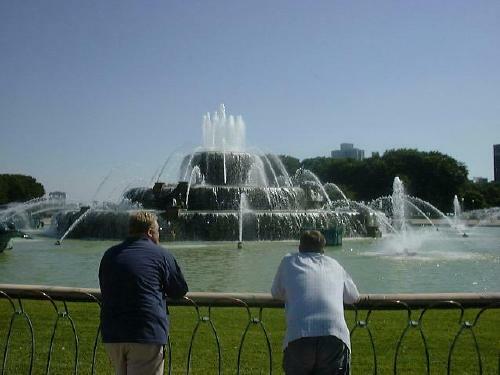 "Love and Marriage, Love and Marraige...."
That's David and Todd with the Buckingham Memorial Fountain in Grant Park. That's the hotel in the background. 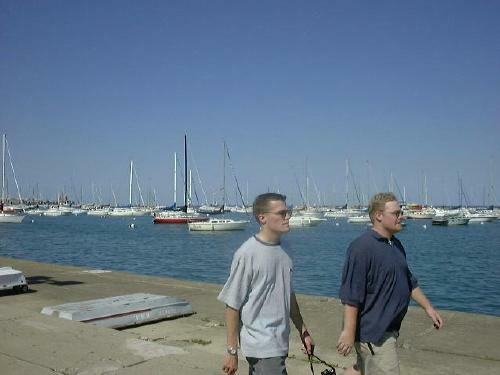 Walking along the waterfront in Grant Park. 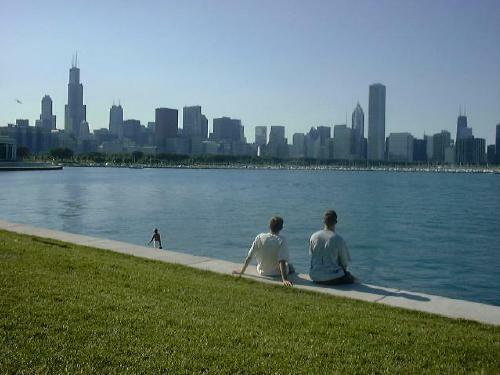 Unlike many other cities, Chicago celebrates its waterfront. 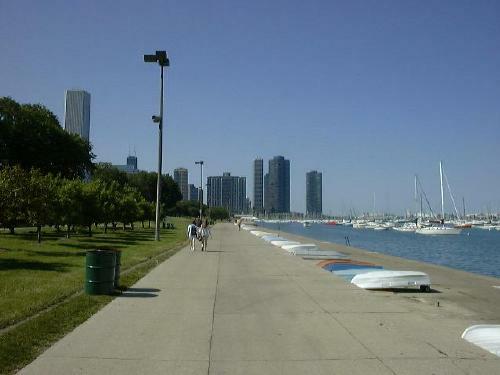 A beautiful warm, sunny day along the boardwalk towards the Museum Campus and Meigs field. 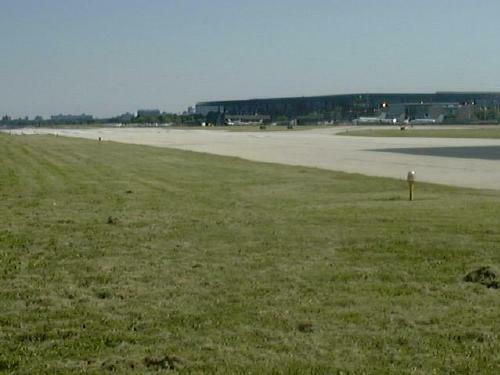 Meigs field runway 18. Nearly closed in 1996, it was saved from park conversion and is now served by business jets, light twins, and singles. 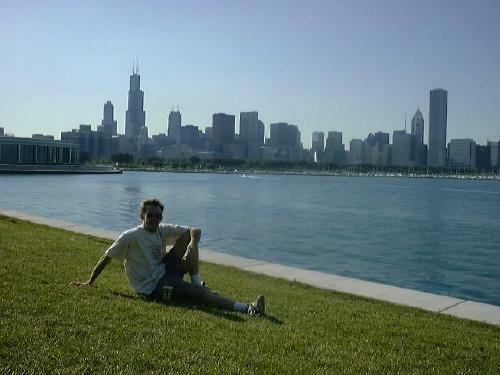 David and the Chicago skyline. City Planners-To-Be contemplate the metropolis.